Four men wrongly jailed for murder are attending a conference marking the 10th anniversary of the Criminal Cases Review Commission. Paddy Joe Hill of the Birmingham Six, Mike O'Brien involved in a Cardiff case and Gary Mills and Tony Poole all spent years in jail. 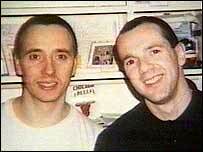 Mr Mills and Mr Poole from Gloucester, served 14 years before their convictions were overturned. The meeting in Bristol is debating the limitations of the review commission. The body was set up in the wake of cases such as the Guildford Four and Birmingham Six to investigate alleged or suspected miscarriages of justice and refer them back to the appeal courts. Dr Michael Naughton, from Innocence Network UK, which organised Saturday's symposium, said: "Contrary to popular perceptions, the Criminal Cases Review Commission was not designed to rectify the errors of the system and ensure that the innocent overturn their wrongful convictions. "Instead, their remit under the 1995 Criminal Appeal Act dictates that it seeks to determine if there is a 'real possibility' that the appeal courts will overturn the conviction." Academics experts on miscarriages of justice from across the UK, the US and Canada are attending the conference.